Well, after a too-good-to-be-true opening of my first box of 2016-17 Ultimate, I had to try another. Of course, I wasn't expecting anything near as epic as that autographed Auston Matthews cards, but I was still curious as to what a "normal" box of this product would bring. Like I said in the last post, each box of Ultimate contains one four-card pack. Of those four cards, there will be one base or insert, one memorabilia card, one autograph or premium relic card, and one rookie autograph. 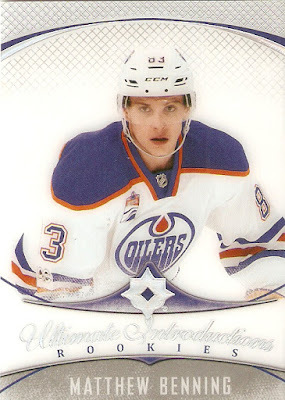 Benning might not be the most well-known young player on the Oilers team, but he has definitely made his mark. After spending two games in the AHL to start the season, he was called up to the NHL, and played 62 games for the Oilers, scoring three goals and 12 assists. He also had three assists in Edmonton's 12 playoff games. Like I said, not the biggest name, but at least he's an NHL regular. 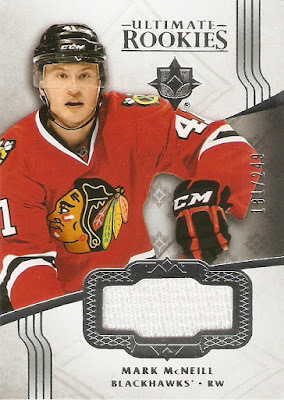 McNeill is featured on this card as a Blackhawk, but has played just one game for the team, in the 2015-16 season. He was traded to the Dallas Stars as part of the deal that brought Johnny Oduya back to Chicago, and played just one game for Dallas this past season, spending most of the year in the AHL. Well, second box of Ultimate, and second card of Milano. At least it's a different one, as the other was an Ultimate Introductions insert card. 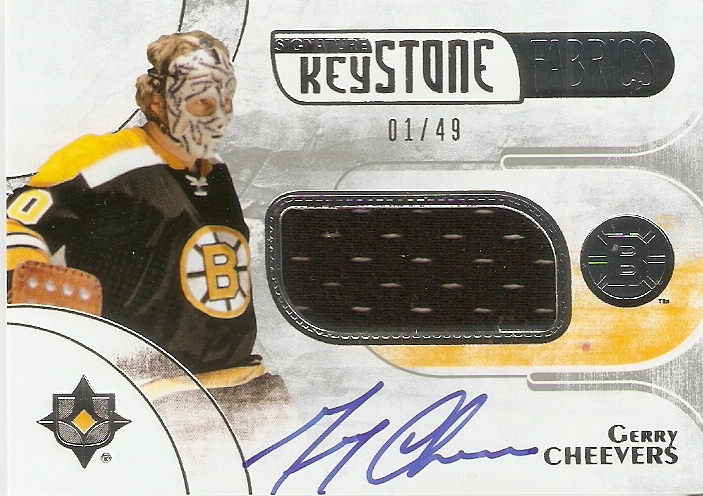 Cheevers had an amazing career, won two Stanley Cups, and was elected to the Hockey Hall of Fame in 1985, but is mostly remembered for his mask. What started as a plain white mask became iconic, when he began adding a row of stitches each time the puck hit him in the mask, representing all the times it saved him from having to put stitches on his actual face. In 2008, The Hockey News ranked his mask No. 1 overall by a wide margin, earning 221 of 300 possible points, far surpassing second-place Gilles Gratton's 66 points. Like I said, I knew I wasn't going to get anything near as great as the last one, but I still did pretty well. 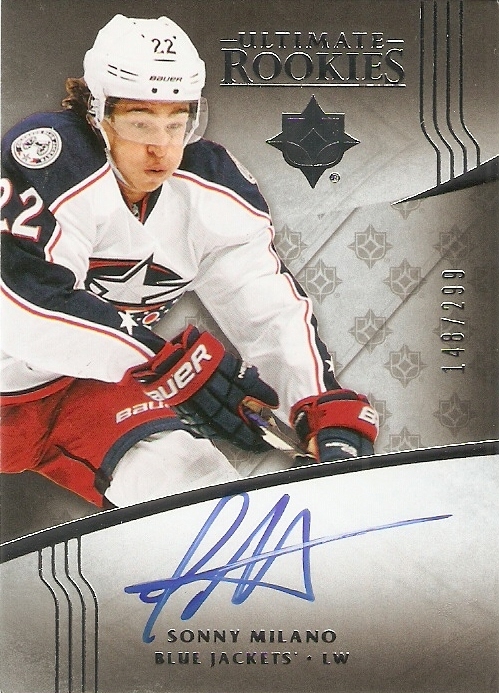 An on-card autographed jersey card of a hockey Hall-of-Famer is pretty great.